Find out how to get the new and improved Gjallarhorn Exotic Rocket Launcher in Destiny: Rise of Iron. Destiny: Rise of Iron has officially released, and that means it is time to start collecting new weapons, armor, and items. This year, though, Bungie has decided to bring back a very special Year 1 Exotic Heavy Weapon, the Gjallarhorn. Many Destiny players may remember this weapon as the most powerful gun in Destiny’s Year 1. This go around it isn’t quite a strong, but it’s still a beast of a weapon to get your hands on. In our guide we’ll show you how to get the new Gjallarhorn, and complete the Beauty in Destruction questline. The first step to getting this weapon is to unlock the Iron Temple by playing through the Rise of Iron campaign. Once you have unlocked it, head back to the Iron Temple and speak to everyone to receive a quest called Echoes to the Past. This is your first step to unlocking the brand new Gjallarhorn. Now you’ll need to complete the Destiny: Rise of Iron campaign, which culminates in the Iron Tomb mission, where you must face down the SIVA threat and shut it down for good. Once you have beat the campaign, head back to the Iron Temple to update the quest. After speaking with the NPCs in the Iron Temple, head down to Earth and patrol the Plaguelands. You’ll need to head to Archon’s Keep, and then start a Ghost Scan Patrol mission in that area. Shiro will task you with scanning an anomaly underneath the Archon’s Forge, which will kick off the rest of the quest. Continue following the quest steps until you’re advised to return to the Iron Temple and speak to Lord Saladin and Tyra Karn. Once you have spoken to them, the quest will update and you’ll be told to collect Iron Medallions. There are seven of these items hidden around the Plaguelands. We’ve outlined their locations below. The first Iron Medallion is located on the rock jump puzzle in the Iron Temple. The second Medallion is located inside the small building just to the right of where you spawn in when you choose the Patrol the Plaguelands node on Earth. Spawn in, look to your right, and head inside the building to find the Medallion on a shelf inside. Next head to Giant’s Husk, an area of the Plaguelands to the right of your spawn point. Once you arrive (the game will tell you), look to your right and climb up the makeshift path to access the overpass above. Locate this Iron Medallion in a small alcove created by several shipping containers. Head to Archon’s Keep (continue moving through Giant’s Husk when going to the right from your Plaguelands spawn), and look for the broken down tower that leads between the Keep and the Forgotten Pass. This Iron Medallion is halfway up the pile of scrape in that area. 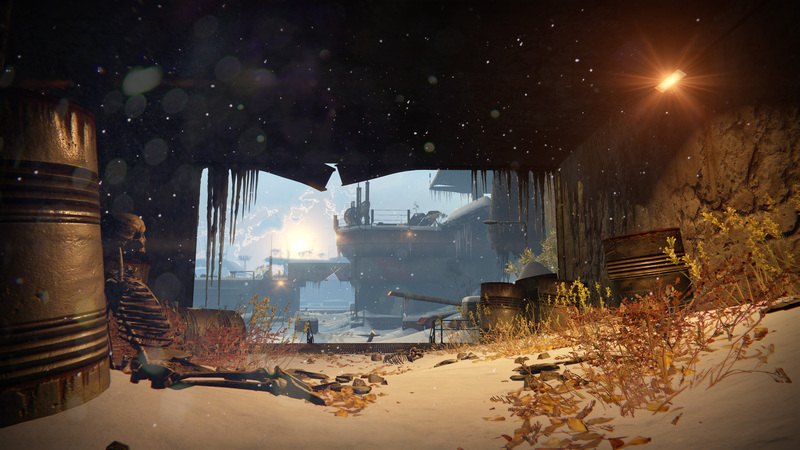 Head down through Archon’s Forge and into Site 6. As soon as you drop into the area, turn to your left to find this Iron Medallion on the ground under the pipe. In the Bunker Trigalav area, head right into the open room with all the Fallen Splicers. You’ll find this Iron Medallion on the ground beside a door that you can find by hugging the left-hand wall. The final Iron Medallion can be found in the Forgotten Pass, at the very edge of the bridge between the Forgotten Pass and Bunker Trigilav. Once you have all seven of the Iron Medallions, it’s time to continue the quest. You’ll need to complete the A Symbol of Honor mission, which takes place on the Crucible Bannerfall map. Head to the mission and complete it to move on. At this point you will have to collect five Dormant SIVA Clusters to continue. We’ve already posted a guide to all the SIVA Clusters in Rise of Iron, so head over there if you need help. Once you’ve completed them, it’s time to finish up the final mission by completing the Beauty in Delivery mission. After you have beaten the mission, return to the Iron Temple to turn it in. You should receive the Gjallarhorn as an Exotic Drop in the mission Beauty in Delivery. Head on over to our official Destiny: Rise of Iron walkthrough for more tips, tricks, and guides like this.